A last-gasp try by Dean Mumm kept alive Exeter's hopes of qualification for next season's Heineken Cup with a 24-18 win away to Worcester Warriors. The Chiefs looked to have thrown away a 14-6 interval lead as a second half rally from Worcester saw them 18-17 in front but a yellow card for Josh Matavesi 10 minutes sealed Worcester's fate. Exeter were much the more creative side in the first half but careless errors allowed Worcester back into the match and ultimately the Warriors could be deemed unlucky losers. The Chiefs made only one change following last week's defeat by Leicester, recalling James Scaysbrook at flanker with wing Matt Jess making his 100th league appearance for them. 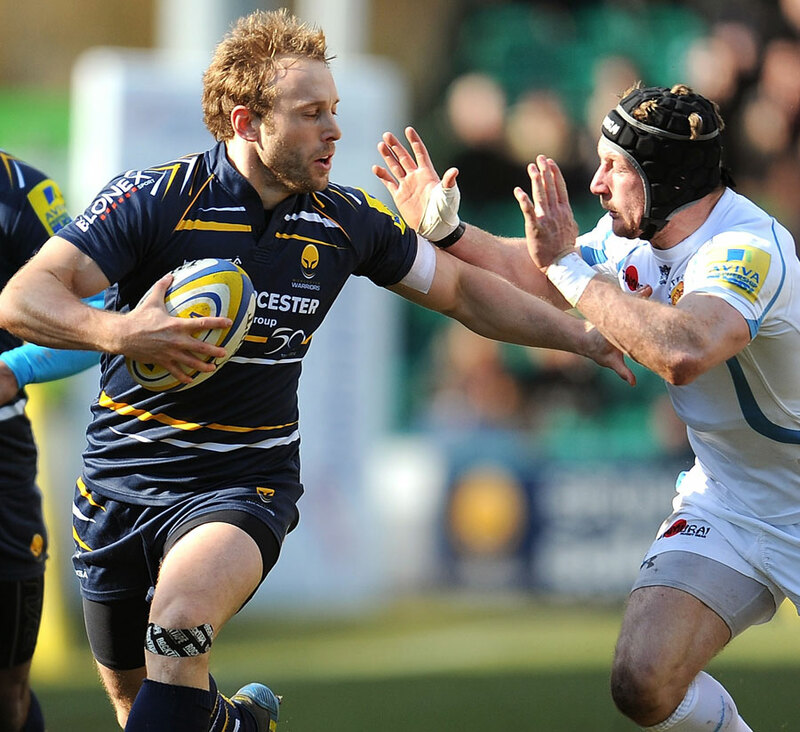 In contrast, Worcester made five changes from last week's disappointing display at London Irish. Semisi Taulava, Euan Murray and Chris Jones reappeared up front with Jonny Arr and Matavesi included in the back division. Worcester made a bright start and took a third minute lead with a simple penalty from Andy Goode. That lead was short-lived as Exeter produced a sustained movement showing excellent ball retention, which culminated in Luke Arscott crashing over for a try which Gareth Steenson converted. The frenetic opening continued with the Warriors appearing to have regained the lead. Chris Pennell and Josh Drauniniu combined cleverly to put Exeter on the back foot, before Goode's cross-kick was easily collected by David Lemi. The wing crossed the line for the referee to signal a try - only for the touch judge to advise that Lemi had knocked on in the process of scoring. Goode gained Worcester some reward with his second penalty after Jack Nowell was penalised for not releasing but once again Exeter responded in style. Another compelling movement ended with Haydn Thomas making a neat break to send Steenson in under the posts for a try which the outside half converted. Exeter were penalised for a careless offside but Goode missed with a long range attempt to leave the visitors deservedly ahead 14-6 at the interval. After the restart Steenson had the first chance at points and he made no mistake with his penalty as the Warriors were penalised for a scrummage offence. This gave Exeter a healthy lead but the Warriors got themselves back into the game with their first try. The home side declined a kickable penalty in favour of a more attacking option and were rewarded when Matt Kvesic drove over from a five-metre line-out. Worcester continued to have their best period of the match with Chris Pennell making a searing break before feeding Lemi, who was hauled down with the line in sight. Goode then went through another huge gap in the visitors' defence before kicking ahead to gain a platform in the opposition 22. Another strong line-out drive saw the Chiefs reeling backwards for Arr to send Drauniniu over for the try which Goode converted to put Worcester ahead for the first time. Steenson missed a penalty but with ten minutes to go the Warriors suffered a big blow when Matavesi was sin-binned for a deliberate offside. The decision proved crucial as it allowed the Chiefs to dominate the remainder of the match and with two minutes remaining the pressure told as Mumm crashed over for the decisive try, which Steenson converted. Exeter director of rugby Rob Baxter was delighted with the character his side showed to comeback and secure a victory that keeps their Heineken Cup hopes alive. "Any away win in the Premiership is a big win," Baxter said. "Worcester don't lose many at home but we controlled the first half as we played with a very high tempo. However, I was disappointed with the first 20 minutes after the interval as we became very edgy and tried to eke out a win. "We are one of the form teams in the Premiership and with three games to go we still have every chance of a return to the Heineken Cup." While Baxter's opposite number Richard Hill was disappointed with the loss, he was encouraged by their improved performance from a week earlier. "I am really delighted with the way we fought back and our driving maul paved the way for two tries," Hill said. "I must give credit to our forwards coach, Nigel Redman, who kicked a few backsides after last week's poor performance (at London Irish)."